Since 1994 Graffitti Studio has been a leading European multimedia localization service provider to the Global market. International TV channels and companies like Microsoft, HP, Nokia, Deutsche Telecom, Gillette, Omnicom, Volvo, Shell, OMV and Phillips have rewarded huge localization projects to us. Knowing that a copy-paste solution is not what our customers expect we have established a trustful network of professional linguists and local marketing consultants worldwide to ensure the most appropriate approach for each multimedia localization project due to local market specifics. We dedicate serious efforts in planning to ensure that original multimedia quality and the essence of the original message is being kept throughout the entire multimedia localization process. 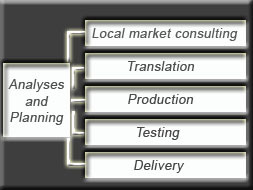 As we work on a project we send our customers regular updates on each localization project level. All production process is held indoors at our studios which cuts down management risks and at the same time gives us the chance to offer very competitive pricing and discounts for our localization services.